During all the shoot sessions, we all had different responsibilities. As the actress, Shayam was in all of the shots so this was her role. She also mainly dressed the set as it was her house and she could get everything ready first. This left me and Monica to share the camerawork and lighting roles. Monica mainly stuck to doing the camerawork as she had some good ideas of angles. As a result, I did some research and had some ideas of what to do in terms of lighting, so I did a lot of this. We also took it in turns to do these jobs, as shown by the photos. Lastly, we all took it in turns using the clapperboard. 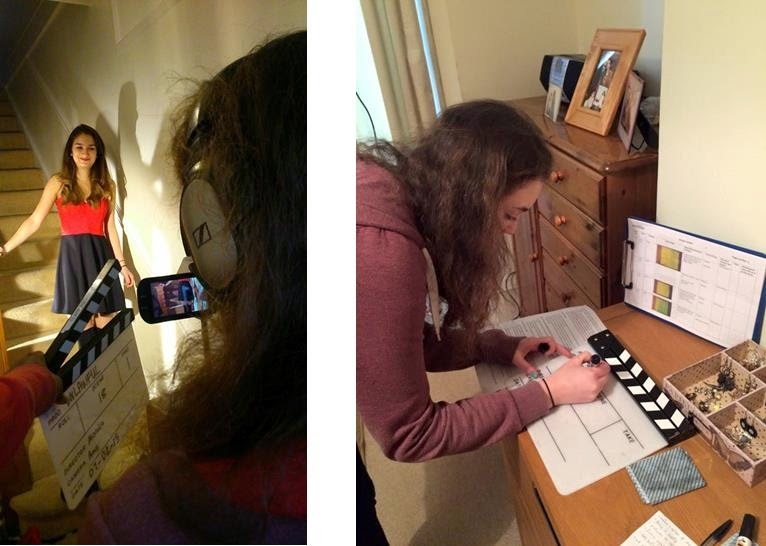 Here are some photos of me on the camera, filming but also me editing the clapperboard. I hoped that with all of us doing individual jobs but whilst also helping each other, we would get the shots done in better time and they would be of a better quality. I therefore felt it was important to do any jobs I had to do well, for example getting the lighting right.